Vintage - Royal Grafton Fine Bone China, Malvern Pattern #6527N, Two Saucers and two Bread & Butter, or Dessert Plates, Circa 1935. Beautiful and Colorful "Malvern Pattern #6527N. (2) Saucers and (2) Bread & Butter or Dessert Plates by Royal Grafton China. 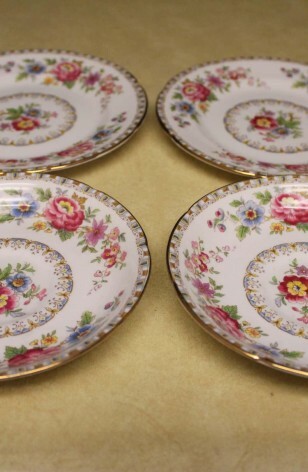 These Plates have a Cream Background with Band of Multicolor Flowers on the Rims, Edge is a Blue and Yellow Design as is the Verge around the Bouquet. Plates are Scalloped and Rimmed in 22kt Gold. Would look lovely in a Trio with Solid Colored Cups... maybe needed as a fill in for your personal set.. Good Resale Condition unless noted below or in pictures. 2 - Saucers - 5"